Around the world, both women and men are involved in agricultural activities. Evidence shows that women provide 70-85% of labor for food production and sales in Sub-Saharan Africa (The World Bank, FAO, and IFAD, 2008 citing The World Bank, 2005). Despite this enormous contribution of labor, women in Sub-Saharan Africa control little of the titled land and other productive assets that contribute to household food security and income creation. It is widely accepted that attention to gender equality and nutrition is necessary for achieving development outcomes (Aakesson, Pinga, and Titus, 2014; Fanzo et al. 2013; Manfre et al., 2013; Kuyper and Schneider, 2016). In most parts of Zambia, women farmers receive only a fraction of the inputs and extension support that men farmers receive. Women also lack formal land title in much of Zambia and are often unable to join producer organizations through which extension services are provided (Farnworth et al., 2011). Despite their great contributions to agricultural production and productivity, Zambian women farmers have inadequate access to extension services and inputs. Zambia has missed opportunities for additional gains in agriculture because women have been overlooked. The Production, Finance, and Improved Technology Plus program (PROFIT+) was a USAID Feed the Future program implemented by ACDI/VOCA in Zambia from June 2012 to May 2017. The program design recognized that equitable access to extension services is a key enabling factor that shapes women’s livelihood opportunities. PROFIT+ developed an inclusive strategy to create equitable and sustainable opportunities for women and men along target value chains in Zambia. The program aimed to enable women and other poor smallholder farmers to increase food security and drive economic growth with new opportunities in agriculture and marketing. 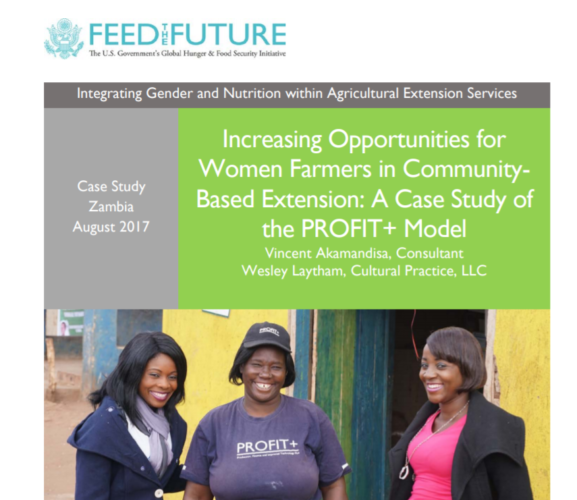 The study, conducted by Cultural Practice, LLC for INGENAES, describes how under PROFIT+ women became dynamic agents of agricultural extension and how agricultural entrepreneurship improved women’s access to agricultural production information and benefits derived from their agricultural activities.